Are you interested visiting Virunga National Park in Democratic Republic of Congo? If yes, and you want to experience gorilla trekking safaris it is very important to secure your gorilla tracking permit in advance through Nature Adventure Africa Safaris Limited the only reliable tour company that work closely with the Virunga National Park offices. When planning to visit Virunga National Park in Congo, one of the many reasons that influence choice of a given country for gorilla tracking is the gorilla permit price difference and you find in Democratic Republic of Congo a permit cost $ 400 USD peak season and low season at $ 200 USD and in the neighboring countries like Rwanda a permit cost $ 1500 USD and $ 600 USD in Uganda. It should be noted that mountain gorillas are found in 3 three countries of Uganda, Rwanda and Democratic Republic of Congo. There almost 880 mountain gorillas remaining in the wild and 480 of these are resident in Bwindi Impenetrable Forest National Park in Uganda while the rest are in the Virunga Mountain ranges that is shared by three national parks of Mgahinga Gorilla National Park in Uganda, Volcanoes National Park in Rwanda and Virunga National Park DRC Congo. 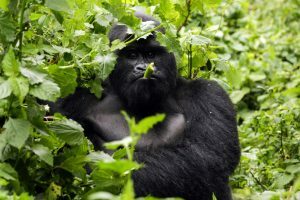 Of these 3 countries Uganda, Rwanda and Democratic Republic of Congo, Virunga National Park offers cheaper gorilla tracking permits than either of its neighbours. The price of gorilla permits in Democratic Republic of Congo is $400, and Congo low season permit is at $200 per person per trek. Congo low season gorilla permits are issued in two phases; the first phase is issued from 15th mid-March to 15th mid-May 2018, while the second phase is from 15th mid-October to 15th mid-December 2018. Low season gorilla permits were meant to attract more tourists to Congo most especially during the low season months. Congo gorilla tracking permits for Virunga National Park remain the cheapest among the three countries. The current price for gorilla permit costs $400 per trek per person, in Uganda the gorilla permit price is $600 while in Rwanda the price stands out to be $1500 per person per trek. Rwanda gorilla trekking permit so far is the most expensive one among the 3 countries. With the increment of Rwanda gorilla permit price from $750 to $1500, Uganda removed off the low season gorilla permit which was costing $450 in order to maintain the affordability of permits in Uganda. The only country now offering low season gorilla permits is D.R.C Congo of Virunga National Park. However, these permits allow whoever books them to spend one hour with the beautiful mountain gorillas. Mountain gorillas are endangered primates and they have attracted many people from all over the world to come and visit them. In Virunga National Park, mountain gorillas can be visited anytime of the year. And the good advantage of trekking mountain gorillas in Virunga National Park is that this region is relatively politically stable compared to other parts of Democratic Republic of Congo, thanks to many organizations who have ensured the stability of the region.